There’s a long standing myth that bears have poor vision. Studies of the eyes of bears, deer and other animals have shown that bears have much better eyesight that you might think. A male grizzly bear was once observed trailing a sow in heat. The male had his nose to the ground and was dogging her. She circled back around and came past him at only about 100 feet, but when he looked up, he did not respond to the sight of her, he kept right on trailing her even though it took him 200 yards farther away from her present location. Many people might interpret this as a bear with poor vision, but a biologist who observed this stated that the male saw the female clearly, but he just depends on his nose so much in his everyday life that he wasn’t going to let his eyesight take over. 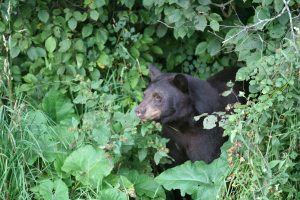 Some recent scientific research has revealed some interesting things about the eyes of a bear and how the bruin’s eyesight compares to others, such as humans and deer. But first, let’s take a moment to understand how the eye works. Eyes of all mammals are similar in structure, but there are significant differences in how they use them, and each mammal has various subtleties that help them survive in their environmental niche. The eye of a deer is quite a bit larger in comparison to their body size than many animals. Their position does not allow for much movement, which is one characteristic that differs from humans and other predators. A bear has much smaller eyes, but they move freely, unlike the eyes of a deer, which are almost stationary. A deer must move its head to see its surroundings. The eye is made up of five basic parts, contained within the ciliary body: The cornea, the lens, the retina, the pupil, and the optic nerve head. The cornea is the protective layer over the lens and it is perfectly clear in animals, while in humans it has a UV filter. The lens is right behind the cornea and it serves to collect the light and direct it onto the retina. The pupil opens and closes to change the amount of light that passes into the eye. The retina is the back of the eye and the light that hits it is sent to the brain through the optic nerve. The retinas in animals are different in several ways, some of which give them significant advantages over predators, or prey, whichever the case may be. So here is how the eye works in a nutshell: The retina is like a movie screen with light being cast upon it. Light that comes through the lens, and is monitored by the opening and closing of the pupil. It is focused by the lens. Now here is where things get really interesting. The eyes of predators, like you and me, and bears, are optimized in a different way than those of prey species, like the deer. If you pay attention, you will notice that your eyes are moving along the lines of type as you read this. Your eyes have a very small point of focus, and everything within your field of view around that point of focus is peripheral vision, but it is out of focus. Look at something in the distance, and bounce your eyes around to look at different things around you. Your eyes move and settle on objects and then your eyes focus on that object. It’s actually a small point that is in focus. That’s because there is a small area on your retina (that screen in the back of the eye) that interprets the light coming through the lens. A bear’s eye is very similar. The eyes of a deer are very different. They actually have a wide band of area on their retina that can interpret light. Scientists call this a “visual streak.” It’s not very tall from top to bottom, but it is quite wide. Think of it this way: When a deer is looking straight ahead, almost the entire horizon is in focus at once! They do not have to bounce their eyes around like you and I. They do not even have to move their eyes at all. The eyes of a predator, such as the bear, are positioned more towards the front of the head, while prey species have them more to the side. It takes two eyes at once (binocular vision) to correctly read depth perception. The brain calculates the difference in distances between the object and each eye, and provides an ability to see in three dimensions. Bears have binocular vision for the entire 120-degree field of view. Bears see color very well. We can tell this by the number and position of the rods and cones in their eyes. Rods collect light, and cones interpret color. Bears particularly see colors on the blue end of the spectrum very well. They may not see reds as well as we do, but definitely better than deer. Deer see blues and greens especially well, but do not see reds well at all. In fact, if you go into the woods wearing a blaze orange shirt and blue jeans, a deer can pick out the blue better than you can, but can see the orange only as subdued tones. The orange would be barely visible but the blue would glow like the fluorescent orange does to our eyes! Bears are not that extreme, but they do not see reds and oranges very well. The human pupil is round and opens and closes quite quickly. The pupil in a bear’s eye is a slit that opens a little more slowly but it actually opens almost twice as wide as ours. This allows for the collection of more light in low-light or dark conditions. Bears, like deer, have a layer of shiny substance on the retina at the back of the eye. This is called tapetum lucidum. 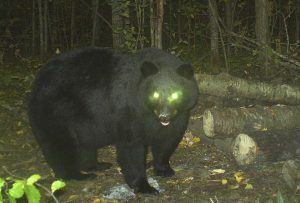 When you shine a light in the eyes of bear, you will see a “glow” which is actually the light reflecting off the retina and shining back at you. It is one of the reasons bears can see so well at night. I mentioned that rods collect light. Bears have about ten times as many rods as you and I have. Plus, when the light is reflected off the tapetum lucidum, it then hits the rods a second time, effectively doubling the amount of light that the bear’s eye can send to the brain for interpreting the world around them. Because of the numbers of rods, the size of the pupil opening, and the doubling of the light by reflection, a bear’s eye can collect about 50 times as much light as our eyes. 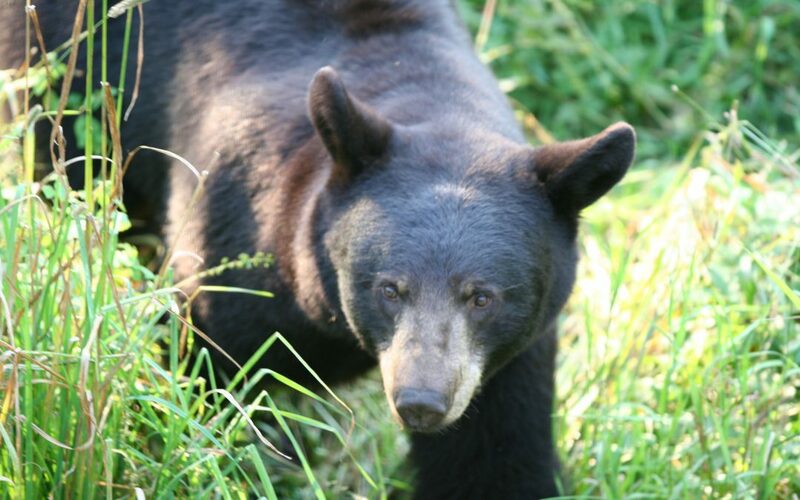 Believe me, when a bear comes into your bait at last light, he can see you a whole lot better than you can see him! Here’s where it gets pretty interesting. Research done at the University of Georgia and the University of Washington found that white-tailed deer have about 20/40 vision. 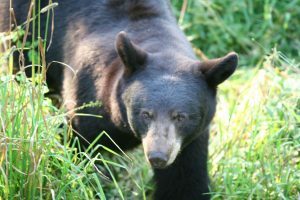 While perfect vision in humans is roughly 20/20, most bears have the equivalent eyesight as humans; however, like humans, there is quite a bit of variation. Some bears have great vision, and some, especially older bears, may have degraded eyesight. But as a general rule, bears see things in better detail than do deer, and about the same as humans. So where did this myth come from that bear have poor vision? Part of it is because their noses and hearing are so good that they do not rely as much on their vision. Another part of it is because people tend to compare it to the deer’s eyesight. Just about everyone who hunts bear, hunts deer too. We have all been picked off by a deer when making the slightest movement at the wrong time. That doesn’t happen as often with bears. While people think that means bears have poor eyesight, it is actually a function of the way the bear’s eyes are optimized for survival. That band of focus that makes a prey species so good at picking up the slightest movement is not needed by the bear… he’s a predator, not prey. So his eyes are designed to seek out food rather than avoid becoming food. The bear’s point of focus that makes him an efficient predator, is his downfall when he is the hunted!